On the Cover: Cara Williams of The Cara Williams Show on CBS (painting by Jon Whitcomb). Of particular interest in this week’s national section is the As We See It editorial which notes that the networks are taking a hard look at their schedules and preparing to drop the ax on struggling shows. 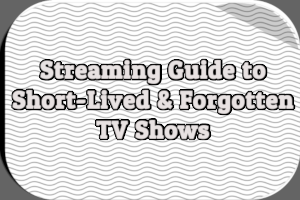 It urges interested viewers to write letters in support of their favorite shows, to try to help keep them on the air. 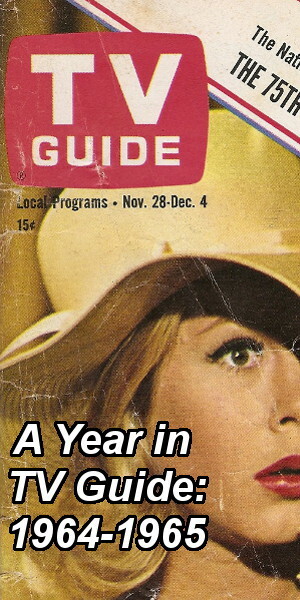 The 1964-1965 season started on September 14th so when this issue of TV Guide was published, it was eight weeks old. That seems like a long time for the networks to wait before deciding what to renew and what to cancel. 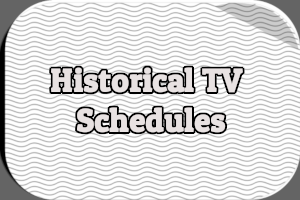 Recall, however, that in 1964 the networks relied on national two-week Nielsen reports which were released a week or two after the two-week period in question. By this point, the three reports covering the first six weeks of the season had been released. There are five articles in this issue. Arnold Hano’s “Mr. Franciosa Changes His Spots” is a profile of actor Anthony “Tony” Franciosa, who several years prior to starring in of ABC’s new sitcom Valentine’s Day declared he would never do series television. What changed his mind? The chance to “discipline” his acting style on television, a lack of available work in movies, and a general mellowing of his personality thanks to his third wife Judy Balaban. Melvin Durslag’s article titled “‘Okay, blabbermouth, let’s see you try'” examines the unusual style of ABC sportscaster Paul Christman, who analyze American Football League (AFL) games for the network. I don’t know anything about football analysis but apparently Christman was quite unconventional although I can’t say I understand exactly why. Apparently he refused to prepare because he wanted to come to games fresh. Audiences seemed to like it. I’m not very familiar with the life of Cara Williams, star of the new CBS sitcom The Cara Williams Show. Leslie Raddatz’s article “The Lady Was a Poker Player” makes her sound like quite the character, with a wild temper and a bad mouth. Her feminine comedy style — as opposed to the “masculine mannerisms” of Carol Burnett and Martha Raye — drew comparisons to Lucille Ball, comparisons she refused to acknowledge. 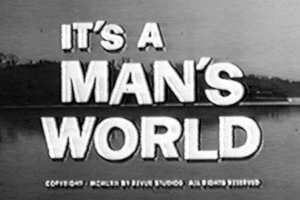 The most interesting article in the issue is “The Man Women Love to Hate” by Robert De Roos, a profile of Count Marco, a television personality appearing on KGO-TV in San Fransisco and KABC-TV in Los Angeles. I can’t tell from the article whether it was all an act or not but the good Count was apparently reviled by women who thought he was serious on television and in print through his weekly column. He opposed the Girl Scouts (“Girls should be taught to bake cookies, not sell them. The only thing a girl can learn from selling cookies is how to solicit on street corners”), told women how to undress in front of their husbands (“Do you crawl out of your girdle like some old sea cow coming up out of a manhole for air, or do you slip seductively out and over it like the nymph in September Morn?”), and tried to sell fanny paddles with which people could smack fat women on the fanny. If any footage from his morning shows exist, I’d be very curious to see it. The fifth and final article is a bizarre list of potential television concept from comedian Bill Dana, ranging from “Peter the Piano Tuner” to “Adequateman.” The national section also included two picture features: one looked at NBC’s upcoming special about the Louvre while the other documented how a bull was made up to look like a buffalo for an episode of The Beverly Hillbillies. To call Cleveland Amory’s review of Slattery’s People in this issue positive would be an understatement. Amory was effusive with his praise for the series and quoted Representative James Corman, who cited the series in the Congressional Record. Sadly, Amory noted that few viewers were tuning in to Slattery’s People every week, a situation he blamed on the show’s “uncompromising unconformity” and the unusual titles of the episodes. He urged CBS to keep the series on the air. NBC won Election Night based on Arbitron national ratings with a 48% share of the audience, followed by CBS with a 37% share, and ABC with a 15% share. 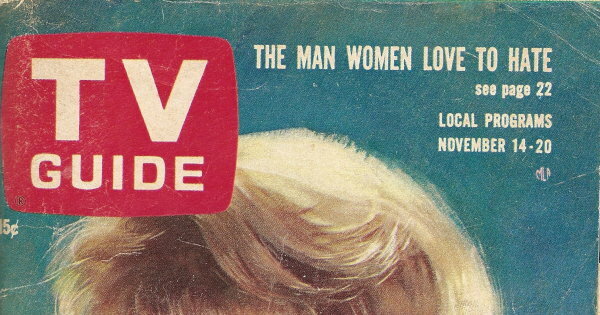 The networks spent $5 million preparing for the 1964 Presidential Election and TV Guide felt did a fine job: “Considering the complexity of voting patterns, television turned in a virtuoso performance.” The networks all encouraged voters in the West to vote despite announcing their projections of the winner early. NBC’s color special “The Capitol” will feature color footage filmed inside the U.S. Capitol when it airs on January 12th, 1965. Stirling Silliphant has been signed by Universal TV to develop a daytime sees called The Bitter and the Sweet, with production set to begin in April 1965. Silliphant will write the first 65 episodes (13 weeks). Silliphant has also written the script for proposed adventure series called Sinbad. Universal has another new series in development called Indictment starring Robert Ryan. Evan Hunter wrote the pilot. Hanna-Barbera has a live-action pilot called “Danger Plus Two” in the works. Just watched Voyage to the Bottom of the Sea’s episode “Turn Back the Clock.” They were very clever to insert scenes from “The Lost World” (which David Hedison also conveniently played in) to make up three-quarters of the show. Trouble was Hedison looked about eight years younger in the movie. Did they have to turn the clock back to an old movie? It is too bad that the producers of Voyage to the Bottom of the Sea did not realize that “The Lost World” was shown on Monday Night at the movies, Dec. 16, 1963, and also repeated this summer. 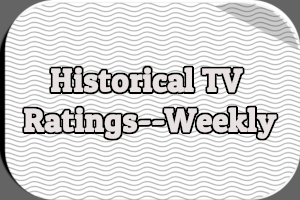 If this continues it will be a voyage to the bottom of the ratings. Other letters were about teenagers wanting to be treated like adults while fawning over “no-talent groups” like The Beatles, The Animals, and The Rolling Stones; the lack of David Niven on The Rogues; and a response to an October 24th article about Cathleen Nesbitt in which Harry Ackerman apparently insulted Minnesotans. The big event in television this week didn’t actually take place. The apparently highly anticipated World Heavyweight Championship boxing match between Cassius Clay and Sonny Liston planned for Monday, November 16th was scrapped after Clay was rushed into surgery days earlier due to a hernia. The bout, which would have been a rematch of their controversial February 25th, 1964 fight, was postponed almost a year before finally being held in May 1965. Advertisement for the Clay-Liston fight on WHCT-TV (Channel 18) – Copyright 1964 Triangle Publications, Inc.
What WHCT-TV aired in place of the game is unknown. ABC’s Wide World of Sports was to include analysis of the first Liston-Clay fight by Howard Coswell on Saturday, November 14th. WNAC-TV (Channel 7) out of a Boston planned a half-hour pre-fight report featuring the station’s sports director John Callaghan interviewing both Liston and Clay. It was scheduled to air on Saturday, November 14th from 10:30-11PM but presumably was scrapped when the fight was postponed. I’m guessing all of the stations in Boston planned on discussing the fight during their news programs on Monday, November 16th. The day after the fight, NBC’s Today was scheduled to report on the outcome. For those who remember 1964, I have to ask: was the Clay-Liston fight really as a big a deal as TV Guide makes it seem? Advertisement for Mogambo on WNHC-TV (Channel 8) – Copyright 1964 Triangle Publications, Inc.
Advertisement for Screaming Mimi on WTIC-TV (Channel 3) – Copyright 1964 Triangle Publications, Inc.
Advertisement for The Jack Benny Program on NBC – Copyright 1964 Triangle Publications, Inc.
Several stations aired local programs on Sunday, November 15th. WBZ-TV (Channel 4) out of Boston had a half-hour program called Focal Point: United Fund from 4-4:30PM about settlement houses and boys’ clubs in Boston, which was followed by a live broadcast of the annual Yankee Infantry Division Show, hosted by Gene Jones from 4:30-5PM. And from 5-5:30PM was another installment of Starring the Editors. Massachusetts stations WWLP (Channel 22) and WRLP (Channel 32) along with Connecticut stations WHNB-TV (Channel 30) and WHNB-TV (Channel 79) aired a half-hour discussion series called Concern from 3:30-4PM, moderated by Dr. Charles Warrnen Barnes, pastor of Hope Congregational Church in Springfield. The topic this week was “The Population Explosion” with Dr. Stephen Plank. WWLP and WRLP followed that with an hour-long discussion of civil liberties from 4-5PM. Advertisement for Western Massachusetts Highlights on WWLP (Channel 22) – Copyright 1964 Triangle Publications, Inc. If they have Clay-Liston on the cover, it’s would have sold more copies!!! After all, the failure of “The Cara Williams Show” are one of the reasons of Jim Aubrey’s dismissal as the CBS-TV head a few months later (Largely due to Keefe Brasselle’s agreement with Aubrey)!!! I don’t think that Dean “Husk” was in the JFK Administration though. You probably meant Dean Rusk. Thanks for the correction. I had hoped to blame it on a TV Guide typo but alas the typo was all mine. I was only 4 at the time, but from what I’ve read over the years regarding the Clay-Liston fight, it would have been a big deal. Between the original fight, in February 1964, and the rescheduled rematch in May 1965, Clay converted to Islam, and this created an even bigger controversy; authorities in Boston feared racial violence (Ali was, I believe, a follower of Malcolm X and originally took the name Muhammad X; Malcom X was assassinated earlier in 1965, sparking concerns that an attempt might be made against Ali), and refused to sanction the fight. (Of course, race might have had something to do with that as well.) The fight wound up being moved, on short notice, to Lewiston, Maine. In the event, Clay (the name Ali had yet to come into widespread use) knocked Liston out in the first round on what came to be called the “Phantom Punch.” So I think the fight would have been a big deal, as the heavyweight championship was still one of the premier sporting events in the ’60s. Again, a great write-up this week! I have always loved that painting of Cara Williams. From what I have read about her, she was one of those performers who was on the cusp of hitting it really big, but it just never happened. I would guess that her career never recovered from the failure of “The Cara Williams Show.” About a year ago, I was watching an episode of “Rhoda,” and Cara was playing Joe’s secretary. I think she appeared on that show a couple times. It is too bad she did not become a regular. Like many acting careers, Cara Williams’s career seems somewhat sad when you review it. She was an Oscar and Golden Globe nominee (Supporting Actress, “The Defiant Ones”) and an Emmy nominee (Lead Actress, “Pete and Gladys”), but was already in her 30s when those accolades came, and was unable to parlay them into any kind of lasting success. After the failure of “The Cara Williams Show,” her credits get spottier and eventually fade out altogether. The footage from “Pete and Gladys” that is available on YouTube makes it very clear why Williams was compared to Lucille Ball and was groomed by network execs to follow in Ball’s footsteps. Unfortunately, the footage also suggests why her career tanked – not enough of a unique spark there. In his book about CBS, “Reflections in a Bloodshot Eye”, Robert Metz wrote that Cara Williams might not have been as “reformed” as the article here claims, He quotes people who worked on the show saying she was what we today we call a diva, doing things like arriving hours late for a cast call. It’s possible her reputation may have hurt her more than simply having the show cancelled. His real name was Marc Spinelli. He ended his successful column in the 1970’s after a 15 year run, reportedly after receiving a threatening letter from the Zodiac killer. He died in 1996 at age 77. Paul Christman-A member of “The Million Dollar Backfield”, with Frank Sinkwich and Charley Trippi, which led the Chicago Cardinals to compete for the 1948 NFL title. While he was a bit before my time as an analyst, apparently he was VERY bright, and he was the first analyst not afraid to be critical of play on the field if the situation called for it. He got his start covering Cardinal games for CBS with Joe Boland (each franchise had their own announcers in the 50’s and the bulk of the 60’s), but when ABC won the bidding for the AFL, he was teamed with Jack Buck and Curt Gowdy. The article in question was during ABC’s final year with the AFL package, as he and Gowdy would move with the AFL to NBC from ’65-’67. Christman would return to CBS in ’68, where he and Ray Scott would be the nominal #1 NFL announce crew (the first year that CBS would award games on order of importance), although the majority of games that they would call involved the Green Bay Packers. 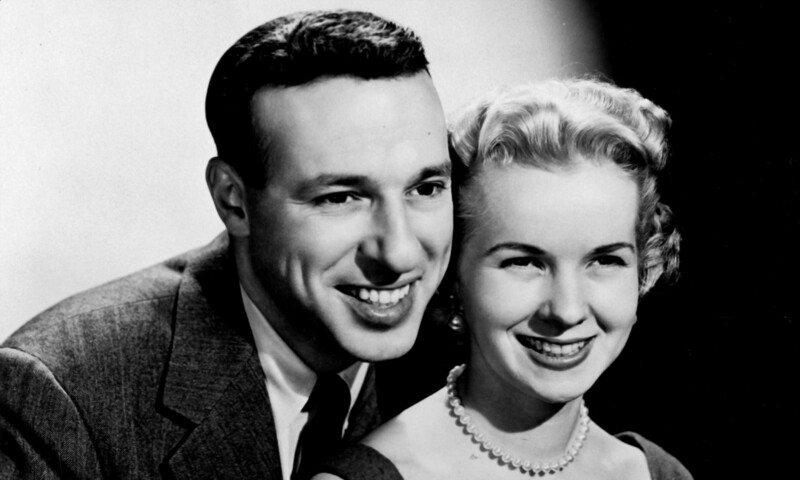 Scott and Christman would work together for 2 years, as Christman died of a heart attack in March, 1970 at age 51. Yes, Christman was very good – I’ve seen and heard tapes of old games that he worked with Curt Gowdy, and while we wouldn’t be surprised by his work today, it was markedly different from what the norm was at the time.